The “Promise” bills are all flawed in important ways, although the Upton bill is marginally the best. The other bills do little more than delay the day of reckoning. Upton’s bill fulfills the need of firewalling the failure—but only through 2014. If insurance companies are going to be convinced to keep offering private insurance outside of the exchanges, it is absolutely necessary that they be allowed to sell it to new customers; otherwise, their pool of non-exchange policies dwindles every month and becomes more subject to the vagaries of chance. I really think the new starting position for the GOP needs to be that people, insurance companies, and health care providers are allowed to opt out of the exchanges and the ACA regulations completely. Even to the point of not having insurance if they don’t want it. Make them affirmatively opt out—force them to make a choice—but let the ACA die by firewalling its failures rather than making “incorrect promises” to fix them. If I’m wrong and the exchanges, unlike the California exchanges, actually work, well, they’ll succeed in the marketplace, competing against non-exchange policies. That plus, potentially, the Rubio bill, would quarantine Obamacare’s failures into a smaller and smaller problem, making it progressively easier to find a solution. 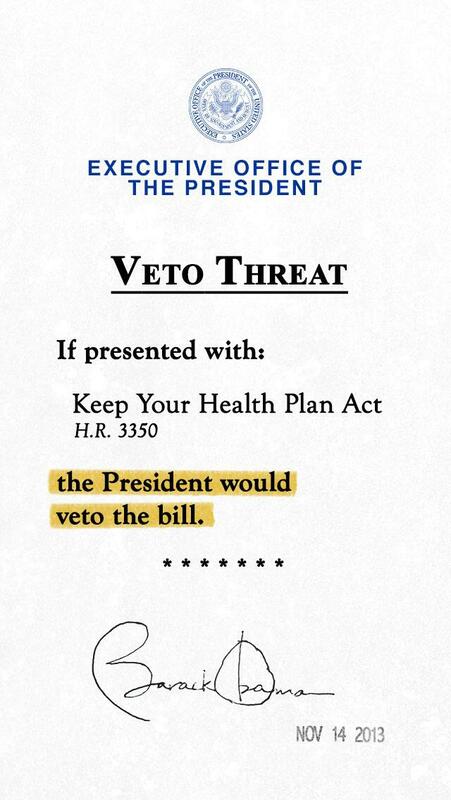 Obama, of course, has threatened to veto the Upton bill (and most likely the Landrieu and Johnson bills as well). To greater and lesser extents, these bills maintain a private insurance market outside of the exchanges. By existing alongside the exchanges they will make it obvious how bad of a deal Obamacare is. People will be able to compare private insurance to exchange insurance—prices, deductibles, and coverage. But another lie in the making is that the Affordable Care Act calls for a bailout to insurance companies if payouts exceed payins under the exchanges. This allows, as Maryland tried to do, selling exchange policies under cost and bilking taxpayers for 80% of the rest. That is, the cost of policies won’t decrease, merely how they get paid for. That’s what Rubio’s bill fixes. If Republicans are going to acquiesce to a fix, it should be that insurance companies can continue to sell non-exchange policies that are fully separate from the exchanges, and do not subsidize exchange policies. This will make the differences between the exchanges and private insurance obvious. The best solution is H.R. 3350’s open market combined with S.1642’s unlimited duration. In response to Why we must not ration health care: Rationing health care means fewer cures. Fixes, fast and furious last modified November 15th, 2013.